Dan Greeley of Belfast was the first to grab the wheel of cheese during an adult race in the sixth annual National Cheese Roll Championship in 2012. 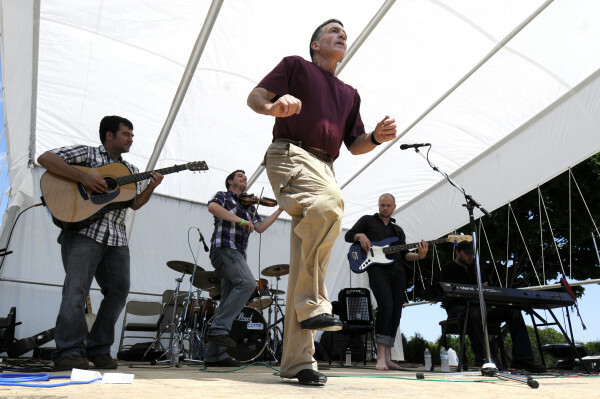 Bob McCormick of Blue Hill performs a reel dance to the Celtic fusion music of the Sprag Session during the 2012 Maine Celtic Celebration in Belfast. Thousands turned out for the Maine Celtic Celebration in Belfast in 2012. BELFAST, Maine — Over the coming weekend, this midcoast city will have a few more things in common with its namesake Irish city across the Atlantic Ocean, as it hosts the ninth annual Maine Celtic Celebration. 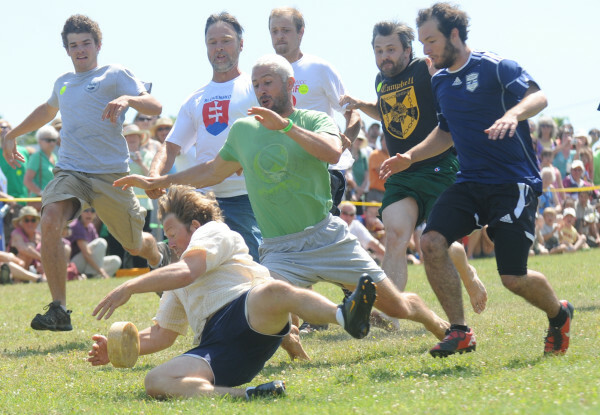 The green slopes of the local Belfast waterfront will ring with the sounds of fiddle, guitar and the insistent beat of the bodhran, an Irish drum, and the cheers of the spectators watching events, including the ever-popular New World Cheese Roll Championship. 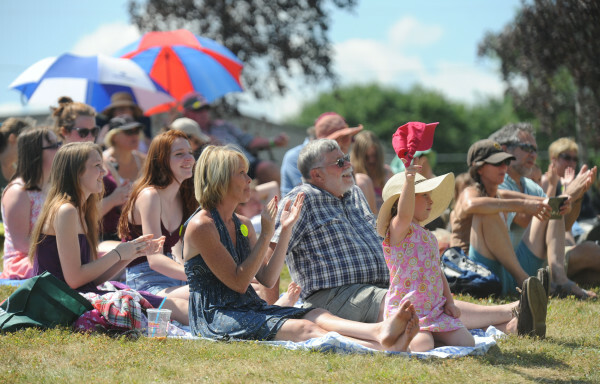 Last year, about 3,000 people came to the three-day festival. In fact, some of those dogs will be invited to participate in the Celtic Breeds Dog Parade, held at 10 a.m. Saturday, July 18, she said. Although that event and many others are old favorites, there will be several new features for the festival, including the fact that the city of Belfast has been working on sprucing up Belfast Common and the waterfront. Something else Luchetti is excited about is that Irish music legends Jimmy Keane and Robbie O’Connell, whose uncles are the Clancy Brothers, will perform and do workshops at the celebration. “I think that most people who know or who have heard of the celebration do enjoy coming because it’s such a beautiful place,” she said. Other popular events include the Manx Three-Legged Uphill Race, the family friendly kilt competition, the Kilted Canter 5-kilometer road race, the Highland Heavy Games and the Saturday night fireworks. The Galley Rats, a Bangor-based band that plays maritime Celtic music, also will use the festival to debut its first album, she said. The Maine Celtic Celebration begins at 6 p.m. Friday, with three musical acts playing on the main stage on the Belfast Common. Luchetti urges all attendees to consider donating $10 to the event so it can continue in the future. She said that since the Celtic Celebration stopped having a bucket brigade of volunteers go through the crowds to ask for money and started having donation stations at three entrances, organizers have had more success with raising money. For more information and a full schedule, visit the website mainecelticcelebration.com.